This easy DIY Spring Wreath Craft is a great craft idea for kids to make for a Mother’s Day gift! Ready to spruce up your front door for spring? This easy Spring wreath craft will keep the little ones busy for an hour or so, and they’ll love knowing that this will be on display hanging from the front door for everyone to see! With a few craft store supplies, you can have an easy Spring (or Easter!) wreath such as this one welcoming your guests in. Take a look below for all you need to know about making your own. We were able to find all of these supplies at our local Hobby Lobby store. Ours had wreaths for around $3 that were already colored. If you can’t find colored wreaths, buy a $1 wreath at your local dollar store and spray paint it. Easy peasy! 1. Begin by painting your wreath if needed. If not, move on to the next step. 2. Take your felt flowers (we found these at Hobby Lobby for around $2 a package) and apply some glue to the back of them. 3. Press the flowers to the wreath, winding them in and out of the vines so they are secure and above all, look natural. You can then add some ribbon for hanging if you wish, or just leave it as is. This wreath is light weight so it will hang on your walls easily. 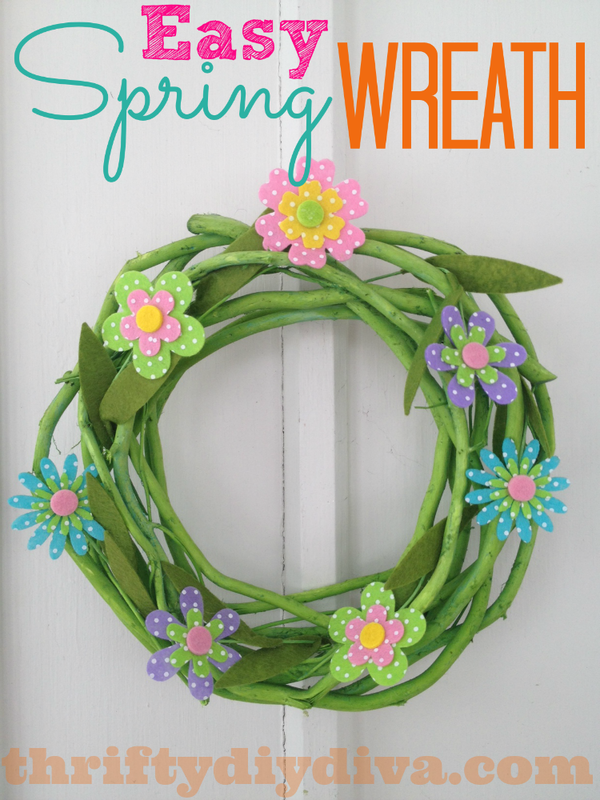 How sweet will this spring wreath look in your home or office? It is easy to make and even easier to enjoy! Head to your local Hobby Lobby and gather the supplies you need to craft your own. It is sure to get you in the spirit of the spring season while still keeping some green in your pocket.